Thomas Thrum : Hawaiian Almanac and Annual, 1882. 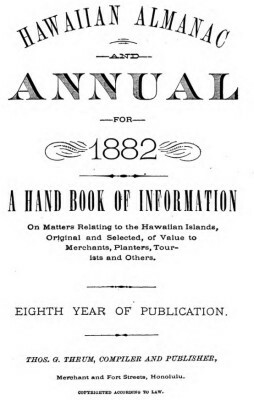 Hawaiian Almanac and Annual for 1882. Black & Auld, Printers, Honolulu, 1882. Among the various sports and pastimes of the ancient Hawaiians, but few now remain to them, the principal one of which - enjoyed equally, we might say, by spectator and participant - is that of surf-bathing, or more properly speaking, surf-riding. There are a few localities on each of the islands where this sport can be practiced when the weather allows and the surf is at the right height; but of the different locations known to us, Hilo seems to hold the palm. The people of Kauai generally held the credit of excelling in all the sports of the islands. At one time they sent their champion surf-rider to compete with chiefs in the sport at Hawaii, who showed them for the first time man's ability to shoot, or ride, with the surf without a surf- board. Geoff Cater (2017) : Thomas Thrum : Hawaiian Almanac, 1882.